St-Aubin-d'Arquenay, K.V.U.Gr Riva-Bella, K.V.Gr Caen. 1./ HKA-Abteilung 1260 / 5 or 6 x 155mm? 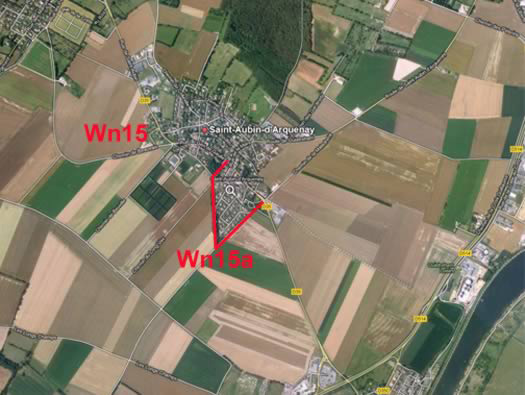 Wn15 d'Arquenay was probably just a fall back position or a check point and Wn15a was the site of a sanitätsstand which may have been casualty evacuation centre, or a small hospital in one of the large houses in the village. 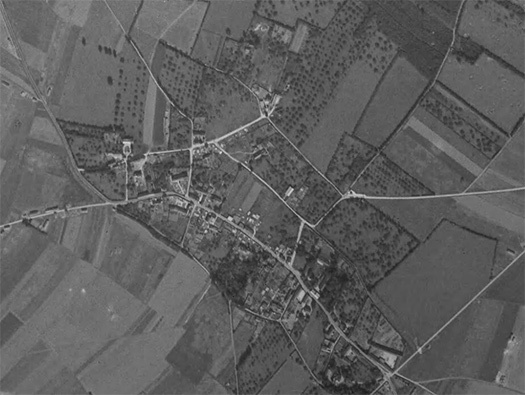 Wn15a looks as though it had a wire defence around its north side, probably wire and mines and in the middle is a large house which may have held a hospital. Sanistät bunker that may be like the one that was here somewhere? 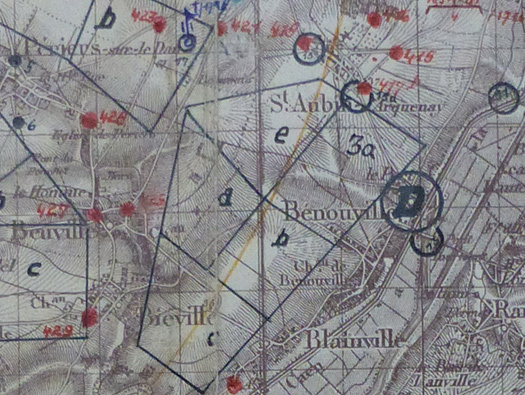 Allied Bigot map of the village showing a defence to the south side. Pillbox for infantry weapon 3 of. 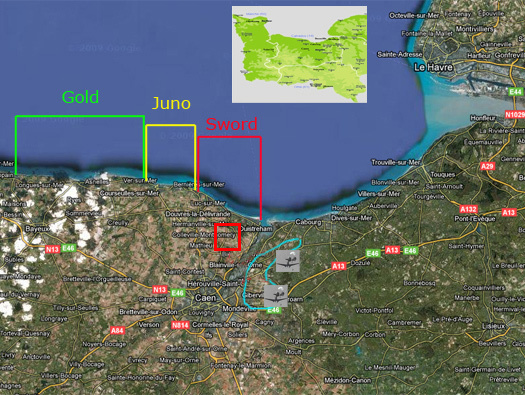 Route of the Commandos. (FUP) Forming up Point. Commando advance on to Pegasus Bridge. We pushed along the narrow track through the thick scrub. I spotted movement in the bushes to our right. The column halted and flattened itself on the track. 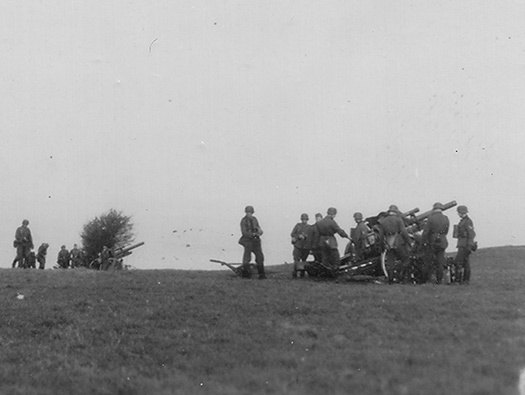 We fired into the scrub on our right; after the second burst a small knot of Germans came out and surrendered. There was not time to waste now and we pushed on as hard as we could down the track, bustling our German friends along with us. Their movements became more and more reluctant. Eventually one of them no doubt un willing to make the "supreme sacrifice" drew his interpreter's attention to the next bend in the track where an enemy post was situated. Once we knew where it was, we were able to deal with it far more quickly and economically than would otherwise have been possible. 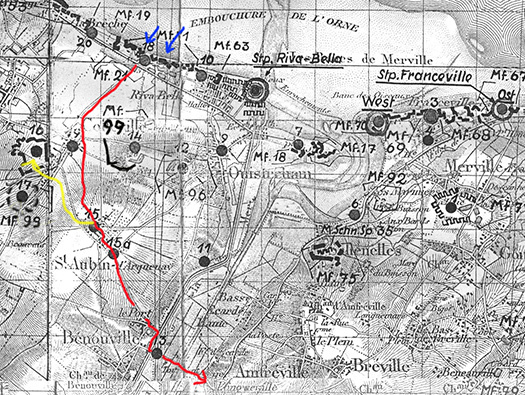 Our plan of cutting through the unlikely places and avoiding, as far as possible, German main defensive positions seemed to be working out, and we were now up to schedule after our quick work in the last half mile. We had managed to insinuate ourselves through the much vaunted West Wall, by taking the most remote cross-country diversions. No doubt the highways, and other likely approaches, were watched with great vigilance but the minor tracks were not. 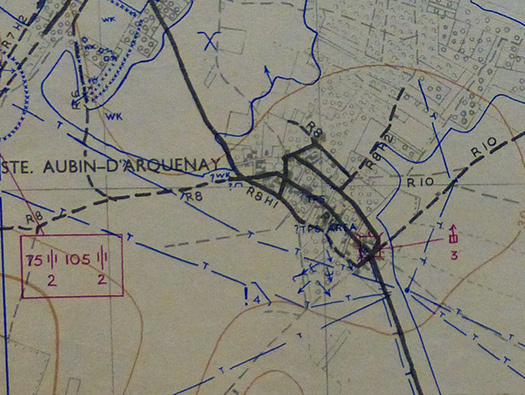 Soon we came to the outskirts of a small village called St. Aubin d'Arquenay, and close by,in a field on our right was the noise of fire firing (This could be Wn16 'Morris'). The guns were firing on to the beach. One troop peeled off and attacked them in the rear (yellow on plan). The battery was manned by Italians who surrendered without much fuss; to be honest, they were well and truly taken aback and had not much option. We left a working party to spike their guns, whilst they joined our motley column of prisoners The village itself lay ahead: we swung left and hit the main road between this village and the Orne Bridges. Here was a straight run down towards the Canal. We made all possible speed. If the Germans had any tank available they could have cut out our column badly here. A mile and a half down the road, near the Canal, we came under desultory rifle fire which did not slow us down. Lord Lovat joined us here. He had come up ahead of the main body of the Brigade to make a time check and reconnoitre the position. He congratulated us on the progress we had made, as he was naturally anxious to keep his date with the Airborne troops at the bridges which were now in sight. We were now well through the German Coast Defences and were only hindered occasionally by light automatic fire and snipers. Soon Lovat was hailing Colonel Pine-Goffin of the Parachute Regiment - I am sorry he said that we are a couple of minutes late. As we crossed the swing bridge over the Caen Canal we could see the crashed gliders which had landed on the isthmus between the Caen Canal and the River Orne. It had been a perfect landing in the darkness and the glider party had seized the bridges intact.. In the fierce fighting during the next ten days the Brigade never surrendered a foot of ground, but they suffered many casualties. Among them was Lord Lovat the Brigade Commander whose gallant leadership and complete disregard for his own safety not only on this operation but throughout the war, had been an inspiration to everyone. Derick Mills Roberts (Commando papers). From the film 'The Longest Day'. This is from a captured German fire plan plan for the D-Day areas so a defending unit can call down artillery fire on certain areas. I think the numbered red dots are individual areas, cross roads or woodland which would be important to an invading force. German field artillery in action.